It was a powerfully bearish week for US equity indexes, with net weekly declines ranging from -6.4% (Trans), -5.2% (R2K), -4.2% (Dow, NYSE comp'), -4.1% (sp'500), to -3.7% (Nasdaq comp'). 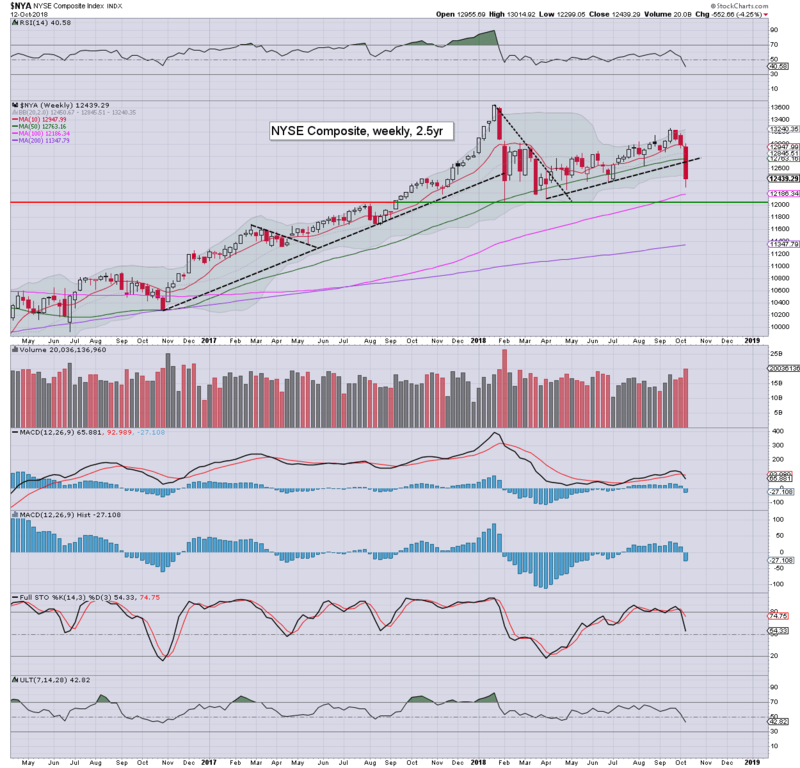 The spx fell for a third consecutive week, settling -118pts (4.1%) to 2767, with an intra low of 2710. 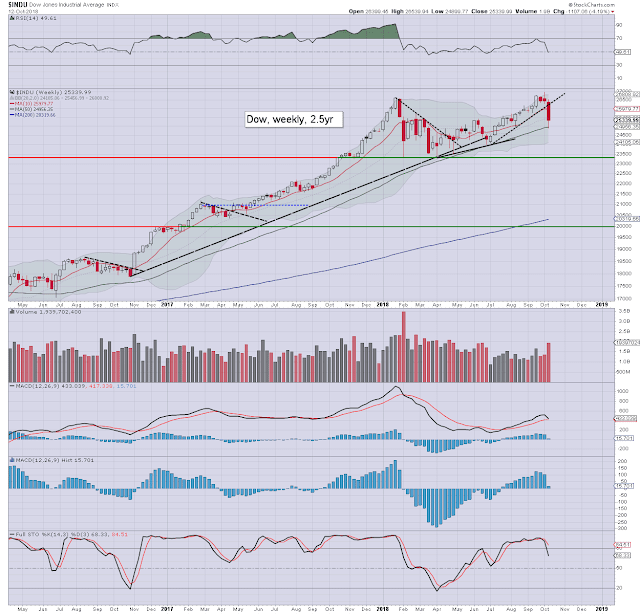 Weekly price momentum has turned outright negative, with a bearish macd cross. 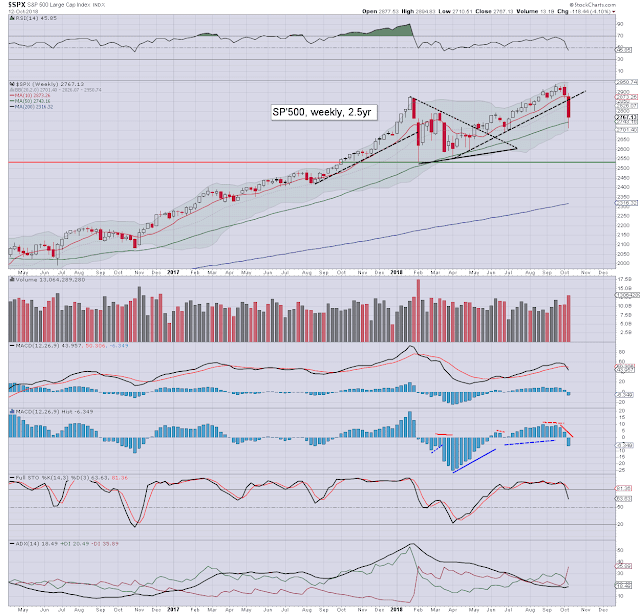 Note the lower bollinger at 2701. Best guess: next week might well open higher, but another s/t rollover will offer a marginally lower low to around 2700. That would make for a more natural key low, with renewed upside into Friday opex. I'd imagine the market makers might seek to pin the spx to around 2800. 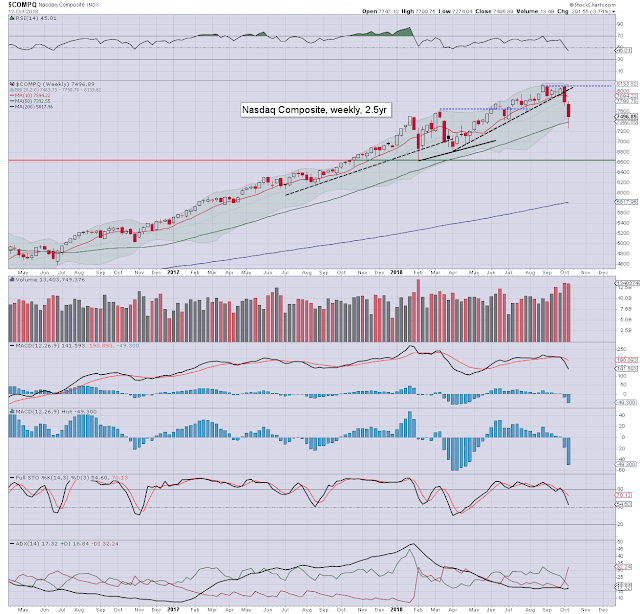 Tech cooled for a second week, settling -3.7% at 7496. Note the pierce of the 50wma, which hasn't been traded under since July 2016. Another rollover early next week would offer the 7200/7000 zone. The mighty Dow fell for a third week, settling -1107pts (4.2%) to 25399. Underlying macd (blue bar histogram) will see a bearish cross at next Monday's open, and that does lean to further s/t weakness. 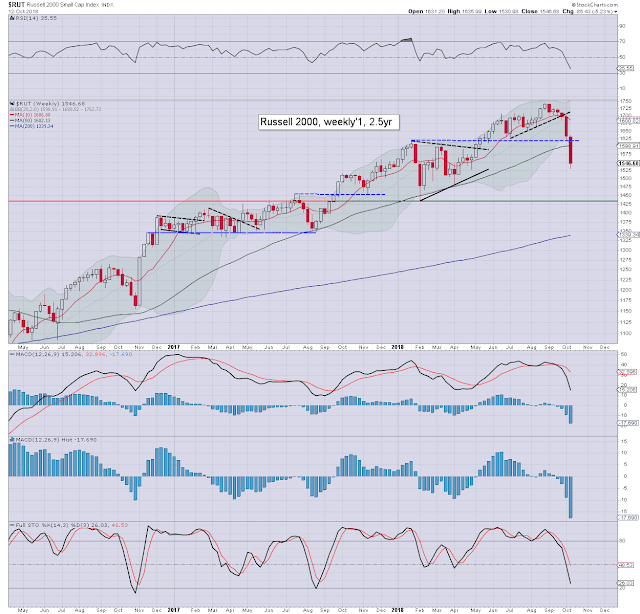 Note the lower bollinger, offering next support in the 24100/200s... a clear 1000pts (4%) lower. A third consecutive week lower, settling -4.2% to 12439. The Feb' low of 12048 is just 3.1% lower. 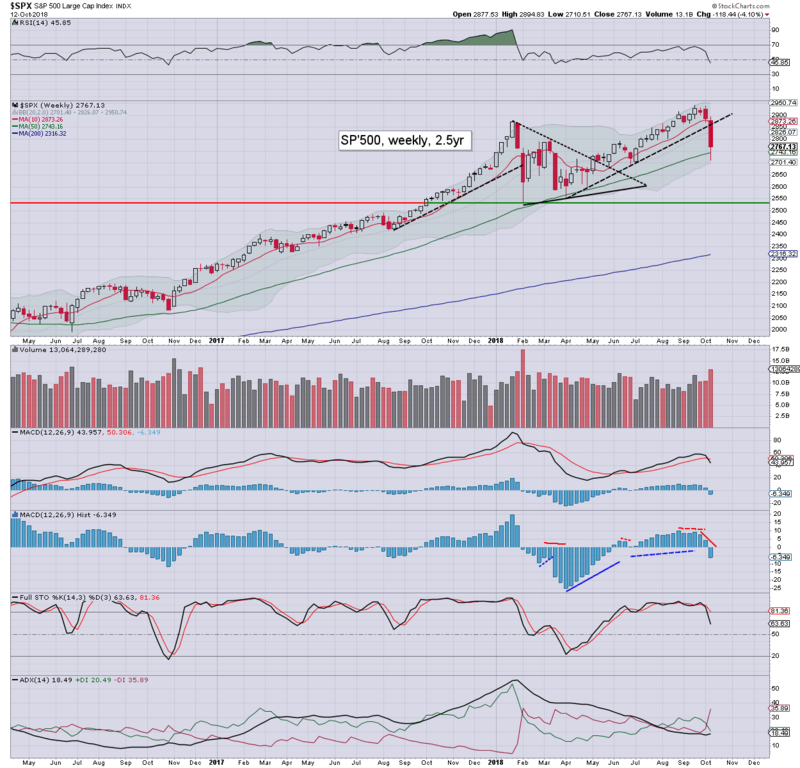 The R2K fell for the 5th week of 6, settling -85pts (5.2%) at 1546. Underlying macd cycle is at -17.69, the lowest since Sept'2011, when price was around 675. 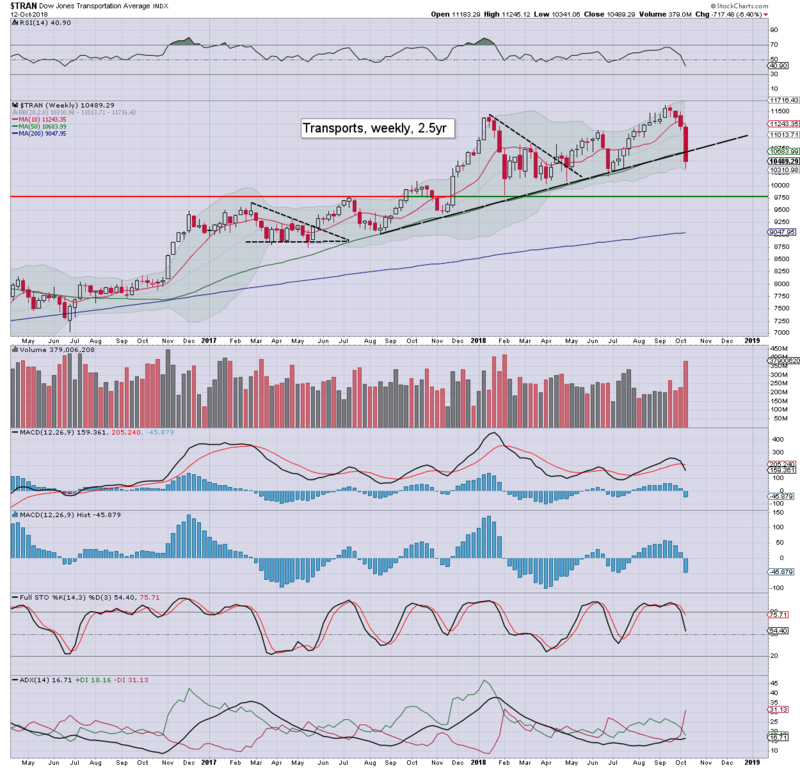 The 'old leader' - Trans, was the weakest index/sector this week, with a net weekly decline of a rather severe -717pts (6.4%) to 10489. There are multiple aspects of support all the way to the 9700s. 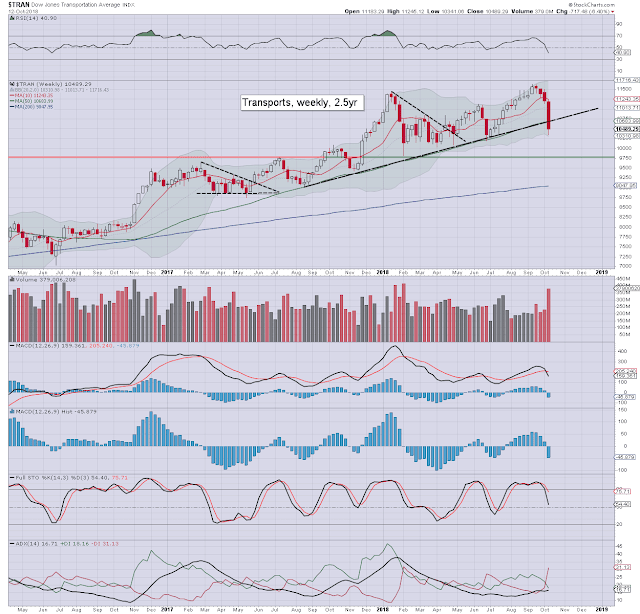 WTIC/fuel prices remain a valid concern, but as seen with Delta Airlines (DAL), so long as the broader economy is growing, higher costs are tolerable, and can be (at least partly) passed onto the consumer. All six of the main US indexes were powerfully lower. The Transports lead the way lower, whilst the Nasdaq was most resilient. Since the Wednesday drop, the usual suspects have crawled out of their holes once again. They are the same people who were calling for financial and economic Armageddon this spring. 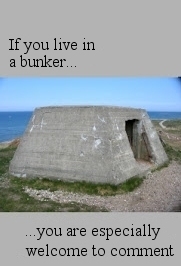 With the market eventually breaking new historic highs, they scurried away, back into their holes. If you ask any of them why the market was whacked this week, some might start throwing out the same nonsense... an over-valued market, higher rates are bad for the economy, or that the bull market is simply exhausted after almost a decade. 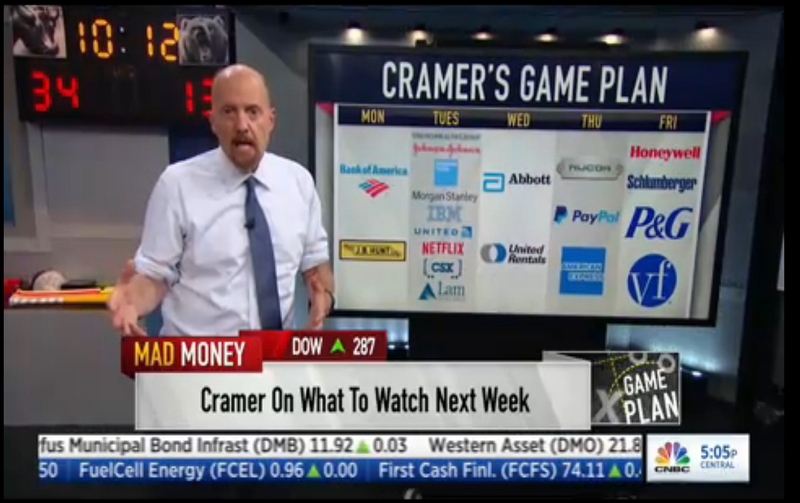 They sure won't quote to you any econ-data or corporate earnings. No, they won't do that, because the econ-data and corporate earnings continue to come in broadly fine. Neither will they raise the issue of capital flows into the US, or that the USD is still king of FIAT land. Instead, they might start touting an imminent USD collapse, or that Gold will soon hit 2k, 5K, or even higher. I could highlight a fair number of these people, but you should know the names by now. Could the market see another wave lower next week? 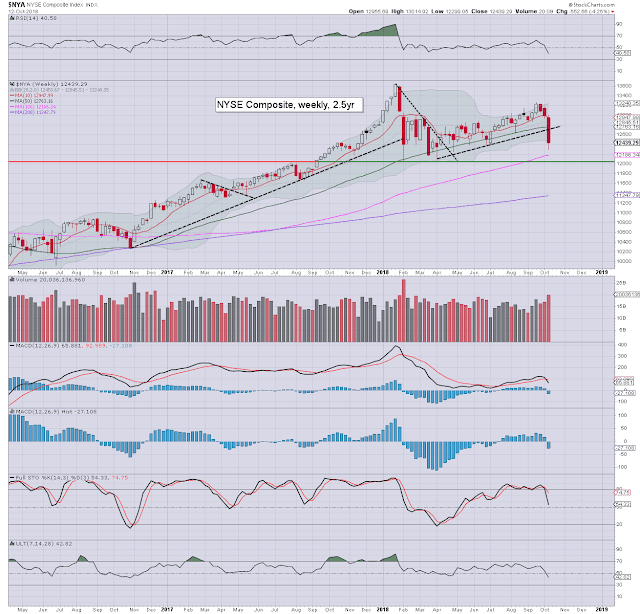 Of course, and weekly support on the Dow is another 4% lower, which would equate to sp'2675/50. 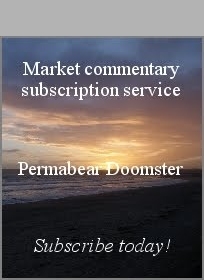 Were the market to settle the month below current levels, that would merit alarm bells. However, we've 13 trading days left of October, and a lot can happen between now and then. To me, the ultimate sell signal will be when the Fed suspend QT and/or cut rates. Fed rates, with the sp'500, monthly, 20yr. As things are, another hike is due in December, regardless of whatever the US President might wish. Powell should be very inclined to resist such wishes, and ignore the criticisms that the fed is 'crazy' or 'out of control'. In the most recent cycle, the Fed cut rates in Sept'2007. The market maxed out one month later. Every cycle is unique, but I would look to the fed as the (ironic) ultimate sell signal. Just so there is no misunderstanding, were the fed to suspend QT and/or cut rates, yours truly would call for a grand decline. The most natural target would be a back test of the 2000/2007 double top of the sp'1500s. As things are, my outlook is that we'll see the Fed raise rates in December, and at least twice more in 2019. If I'm right, those calling for an equity collapse will have to remain in their holes until at least mid 2020.